We haven't had much to say about the process as of late... because we're drowning in paperwork! We essentially have 2 sets to complete. The first set goes to our local agency so we can begin our home study. The second set will need to be notarized and certified in Harrisburg before it can be sent to Ethiopia. This is called the dossier (dos-ee-ey). Oh yeah. Learning new words and new things everyday with this process. Remember Give1Save1 that we have been telling you about? If you wonder if $1 a week can make a difference, you will want to check out this post with family updates. It's great! How is it possible to turn a paper clip into a guitar, laundry machine, bicycle, or other huge object like a yacht? Through the game Bigger & Better. It's a team building activity in which teams are given a small object, like a paperclip, and must keep trading and upgrading their objects to get the biggest, best objects possible until the time limit expires. Today's challenge is to trade up $1 and make it count for more. How's that? Well, what can you really get for just $1? Not much of value these days. What if you join hundreds (maybe thousands) of other people at Give1Save1 and bless an adoptive family with $1 this week? May not sound like much, but when it's added all together, it could make the difference in a family's ability to have their adoption completely financed! Many people don't have large sums of money to donate to adoptive families, but almost everyone can spare $1. That's the premise behind the website Give1Save1. We want to use our blog to spread the word about families you can help. Okay, we are so excited to share this website with you. 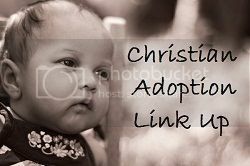 It is called Give1Save1, and it is a place for people who want to use their money to bless others in the adoption process. Every Monday, they feature a new family who is adopting. It is a chance to be generous with as little as $1! But that money will add up when hundreds or thousands of people get excited about helping these families. We have begun following this site and donating, because it is just so exciting to see what your little $1 a week will do. And no, we don't know any of these families personally. But isn't that so cool that families are being blessed by total strangers? $1 is so small. Yet, it can be used for such good. Go ahead, skip coffee out tomorrow and make it at home. There's your $1. Or use a coupon at the grocery store. There's your $1. So easy. By giving $1 each week to their featured family, you are helping to change lives. And you may never know the full impact of your giving.